The vote Tuesday by the IOC's executive board stunned the world's wrestlers, who see their sport as popular in many countries and steeped in history as old as the Olympics themselves. 2004 Olympic Greco-Roman champion Khasan Baroev of Russia called the decision "mind-boggling." "I just can't believe it. And what sport will then be added to the Olympic program? What sport is worthy of replacing ours?" Baroev told the ITAR-Tass news agency. "Wrestling is popular in many countries — just see how the medals were distributed at the last Olympics." American Rulan Gardner, who upset three-time Russian Olympic champion Alexander Karelin at the Sydney Games in an epic gold-medal bout known as the "Miracle on the Mat," was saddened by the decision to drop what he called "a beloved sport." "It's the IOC trying to change the Olympics to make it more mainstream and more viewer-friendly instead of sticking to what they founded the Olympics on," Gardner told The Associated Press in a telephone interview from Logan, Utah. According to IOC documents obtained by the AP, wrestling ranked "low" in several of the technical criteria, including popularity with the public at the London Games — just below 5 on a scale of 10. Wrestling sold 113,851 tickets in London out of 116,854 available. The IOC also noted that FILA — the international wrestling federation — has no athletes on its decision-making bodies, no women's commission, no ethics rules for technical officials and no medical official on its executive board. "We were considered weak in some of the scores in the program commission report but strong in others," Samaranch told the AP. "We played our cards to the best of our ability and stressed the positives." 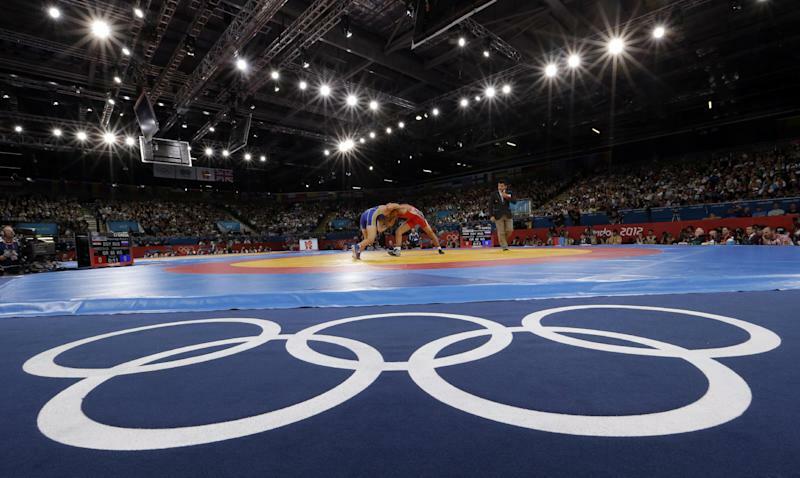 Wrestling featured 344 athletes competing in 11 medal events in freestyle and seven in Greco-Roman at last year's London Olympics, with Russia dominating the podium but Iran and Azerbaijan making strong showings. Women's wrestling was added to the Olympics at the 2004 Athens Games. Karelin noted in an interview with Vyes' Sport that Russians and Soviets have won 77 gold medals. "It's understandable that a lot of people didn't like this," Karelin said. "I'm not a supporter of conspiracy theory, but it seems to me that the underlying cause here is obvious." Tuesday's decision came via secret ballot over four rounds, with 14 members voting each time on which sport should not be included in the core group. IOC President Jacques Rogge did not vote. "I was shocked," said IOC board member Rene Fasel of Switzerland. "It was an extremely difficult decision to take," added IOC Vice President Thomas Bach of Germany. "The motivation of every member is never based on a single reason. There are always several reasons. It was a secret vote. There will always be criticism, but I think the great majority will understand that we took a decision based on facts and for the modernization of the Olympic Games." Wrestling was featured in the first modern Olympics in Athens in 1896. Along with Russia's Karelin, it has produced such American stars as Gardner, Bruce Baumgartner, Jeff Blatnick and Jordan Burroughs. U.S. Olympic Committee CEO Scott Blackmun also expressed surprise at the IOC decision, citing "the history and tradition of wrestling, and its popularity and universality." "It is important to remember that today's action is a recommendation, and we hope that there will be a meaningful opportunity to discuss the important role that wrestling plays in the sports landscape both in the United States and around the world," Blackmun said in a statement. "In the meantime, we will fully support USA Wrestling and its athletes." FILA said in a statement that it was "greatly astonished" by the decision, adding that the federation "will take all necessary measures to convince the IOC executive board and IOC members of the aberration of such decision against one of the founding sports of the ancient and modern Olympic Games." Gardner cited wrestling's worldwide popularity and urged a campaign to keep it in the Olympics. "It just seems like wrestling — if we don't fight, we're going to die," he said. "At this point, it's time for everybody to man up and support the program." "We want to hear what was done to prevent this issue from even being discussed at the board," he said on the Rossiya TV channel. In comments carried by ITAR-Tass, Mamiashvili added: "I can say for sure that the roots of this problem is at the FILA. I believe that Martinetti's task was to work hard, socialize and defend wrestling's place before the IOC." "We are a technical, tactical martial sport where the aim is not to harm the opponent," he said. "Competing at the Olympics is the greatest for an athlete." "The next thing is to sit down with them and see how they can help us," Porter said. "It all depends on the timing, the timing of the season. It's not an easy decision to allow players a week off." Associated Press writers Lynn Berry in Moscow and Luke Meredith in Des Moines, Iowa, contributed to this story.